Cockatiels, How to Select and Purchase a Healthy New Healthy Cockatiel, Buying a Cockatiel, Healthy Cockatiel, Quarantine and New Birds, Quarantining a new cockatiel and cockatiels, Signs of Healthy Cockatiels. printed or reproduced for redistribution without site owner's permission. 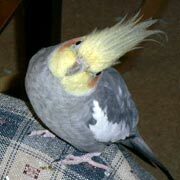 One of the saddest experiences a pet owner can have is to bring home a beautiful, sweet new bird, bond strongly with their little companion, then see their bird die within a week or two. To minimize the chances of this happening to you, choose a bird that looks very healthy and one that is coming from a reliable source and a very clean environment. Also, try to purchase a bird that has been bred in the Spring or Summer, when the natural nesting instinct occurs. Pairs that are bred all year long, become worn out and they produce weaker chicks. Seeing a neglected or sick bird that is withering away in a corner of the pet shop or in somebody's home is heartbreaking. Bringing home a sick bird is noble and you may even save the life of the bird. However, it also encourages the breeder or pet shop to continue selling sick birds and to continue depriving birds of the medical care they need. Other factors to consider when trying to save a sick or neglected a bird is that medical costs could be very high and other birds in you home may catch a contagious illness and get sick too.. All cockatiels are beautiful and the markings of normal grays and mutation are so similar, it's sometimes even difficult for the breeder to tell one bird from another. If you decide to wait until you find a healthy bird, you will find one that looks like the bird you left behind. 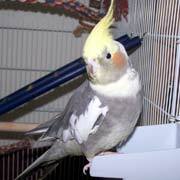 A reputable breeder can usually be found by asking an avian veterinarian or by contacting a local bird club. 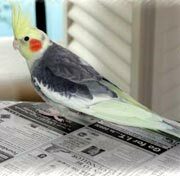 Your local classified ads as well as the back of Bird Talk Magazine and the National Cockatiel Society are other possible sources. Some breeders may require you to wear a smock before seeing the chicks. This is to protect the birds from bacteria and illness that may be brought in by other bird owners. Baby birds have virtually no working immune systems. Pet shops or bird specialty stores that isolate baby birds from the general public are usually reputable too. Their birds are kept protected in separate rooms with glass doors. People can look at the birds but they can not touch them. Avoid purchasing your bird from a bird mart or bird fair. These birds are often sick because they are exposed to many other birds from many different sources week after week. Shop for your new companion when birds are the most vocal, active and feeding, in the morning or evening. 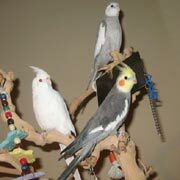 Buy your bird from a breeder or store that has a clean, dust free, well lighted and uncrowned environment for birds. The person in charge should be friendly, caring and knowledgeable about cockatiels. He/she should also be talking to the birds and handling them gently. Sticking a hand inside of the cage to abruptly retrieve a bird for is a pretty good sign that these birds are not having positive experiences with humans and that they may not be tame. Look for fully weaned, young birds that have been hand fed and hand tamed. The longer a bird is hand fed, the friendlier it will be. Young, hand fed, hand tamed birds are usually very friendly, tame, sociable and they are not afraid of people. Their breeder spent a tremendous amount of time socializing them so they would be gentle pets from day 1. Parent fed birds that have not been socialized and birds that have had all negative experiences with humans will not be tame. You will have to tame them yourself. Ask how the birds were fed and if they were socialized. Some breeders feed the chicks by pumping food into their crop with a tube attached to a syringe. Those who breed on a very large scale will use tubes because it's a much faster feeding method compared to hand feeding. Tube feeding can cause birds to have behavioral or eating problems in the future. Look carefully at the cockatiel's diet and living environment. The diet should include pellets, fresh fruits and vegetables. Birds eating only seeds may be reluctant to change diets and eat pellets, fruits and vegetables. Water dishes should contain very clean, fresh water that is free from droppings and food. Cages should be spacious, dust free and clean, without having droppings caked onto bars, perches, food dishes and toys. Birds should not be crammed into small overcrowded cages or placed in cardboard boxes on kitchen floors or countertops. Are the birds banded? Ask about their parents. Inbreeding causes genetic weaknesses and physical problems. A Lutino bred with another Lutino results in a genetic condition called Lutino Baldness. Their heads will have a permanent bald patch. Lutinos should be a very pale yellow to white. 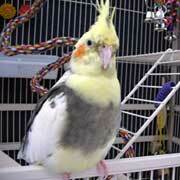 Bright yellow feathers are usually a sign of malnutrition or liver problems. Male pearl cockatiels will revert back to looking like a normal gray after the first molt. Only females retain the pearl markings. If you want a pearl, a DNA tested is needed to verify the gender. Look at the condition of the bird's feathers. Feathers should be thick, glossy and smooth without any noticeable bare patches on wings, under wings, on the back, abdomen, tail or vent area or. Bare patches could indicate poor nutrition, illness or feather plucking. Choppy looking feathers with raggedy edges may indicate a feather plucker as well. Black, raggedy edges of feathers may indicate stress or disease. The bird should have an upright posture with a full-chest appearance. Eyes should be bright and clear. There should be no puffiness, redness or discharge. Nostrils should be completely open, clear of any blockage and without any signs of redness, discharge or sneezing. . The beak should be smooth, close evenly, without growths, rough spots or peeling. The face should not look sticky or wet. The feet of a young health bird will be pink/gray and soft. Older birds have white scales on their feet. Nervous, frightened, or malnourished birds have white-gray feet. Legs and feathers around the vent area should be clean without stains from droppings. The droppings on the bottom of the cage should look like firm coils and not be loose and watery. Droppings should contain a solid green/brown part (feces), a white part (urates) and a clear water (urine). Green droppings indicate a seed diet, larger brown ones, a pellet diet. The urine in droppings should always be clear. Yellow or green urine indicate a sick bird. The white urates should be white. Yellow or green urates indicate a sick bird. If the bird is frightened, droppings may contain an excessive amount of water which is normal. Stand back, away from the cages and observe the birds carefully. Watch how the birds are breathing. Breathing should be relaxed, not labored without wheezing, coughing or tail bobbing. Avoid birds that have a puffed up appearance, with eyes closed and birds that are sleeping on the bottom of the cage. They may be sick. Birds that are hiding in a corner on the floor or birds that are trembling, may be sick or nervous. Very young birds not accustomed to people can tremble when talked to. Step back further and watch how the bird reacts. Purchasing a 2nd Bird and Quarantining: If you already own a bird, it's important that the new bird be quarantined for at least 30 days. New birds should be kept in a different room during quarantine, so they do not come in contact with or share the same breathing air space with any other birds in the home. Disease and illnesses can be transmitted through direct contact, through airborne spores or air circulation of dried feces, nasal discharge, dander or other particles. There can be deadly diseases lurking in pet shops and some of them are fatal. Sources of possible diseases in pet shops include: other birds, small rodents, aquariums and other bird owners who are shopping for new birds. Infections, Psittacine Beak and Feather Disorder (PBFD) Proventricular Dilation Disease , (PDD), Polyoma, Pacheco's Disease, Chlamydia (Psittacosis) Aspergillosis, Giardia, E. Coli are only a few of the many diseases that new birds may have. Even though your new bird looks healthy, it could be very sick . Introducing New Birds to Other Birds: If you purchased a second cockatiel, putting the new bird into the first bird's cage right away is not advisable. The 2 birds may not be compatible or they may fight for territorial dominance with one bird pecking at the other. The dominant bird may also prevent the passive bird from eating and drinking water. Introduce the 2 birds to each other gradually and only after quarantine is over. Place both cages in the same room for a few weeks. Give your birds time to communicate with each other by whistling and chirping. A week or so later put the 2 cages side by side. Take them both out of their cages so they can play together in a neutral area, like a play gym, away from their cages, and supervise them very, very carefully. If they are compatible, they will follow each other around, chirp and possibly preen each other. Then, if you want to put them inside of the same cage, it's advisable to use an entirely different cage and to provide 2 separate food and water dishes so the territory is neutral. If they are compatible and you have a true, male, female pair of birds, sharing cages will eventually result in breeding. The only way to prevent unplanned breeding is to keep males and females in separate cages. Special Thanks to all who shared photos of their birds with us! All Graphics Copyrighted by Credited Artists and are Not Public Domain.